In the Lands Above, on the planet Strata, a young man by the name Torin witnesses from afar how his parents are the victims of a magic spell. An old man, who saw the event from close by, tells Torin that his parents are kidnapped by an evil sorceress, Lycentia, who was expelled to the Lands Below many years ago. Determined to free his parents, Torin travels through the nested world of Strata through the use of Phenocrysts, meeting many interesting characters on the way, such as the snails Slim and Slime, the inhabitants of Escarpa, and the beautiful Leenah with whom Torin falls in love. Torin also has his loyal sidekick, Boogle. Boogle is a shape-shifting creature who can take forms of any item he encounters, and is therefore, in addition to a loyal friend, crucial for Torin to accomplish his adventure. What Torin however does not know, is that he is in fact the son of the king and queen of the Lands Above. His parents were viciously murdered shortly after his birth and Lycentia was in fact his nanny who saved Torin from death. Why was she banned from the Lands Above, why did she kidnap Torin's foster parents, and who was the old man who witnessed it? 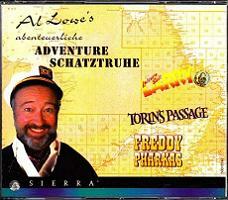 Writer and designer Al Lowe, who also designed the Leisure Suit Larry series, went into a whole new direction with this game. His idea for Torin's Passage sprung in 1994 after watching the film Mrs. Doubtfire with his daughter. He realized during that film that the audience, young and old, had two different kinds of senses of humor, laughing throughout the movie on different places. He developed a game which appeals to all generations. 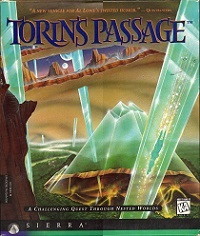 He actually planned Torin's Passage to become a series of 5 games, each covering a significant period in Torin's life. The next 4 games would have been 2) Torin's marriage and assumption of the throne 3) "the rebels strike back" in which Torin's leadership would be challenged 4) the "coming of age", a story about his sons and their fight to be next in line for the throne and 5) the "passing of the torch" in which Al planned to include Torin's death. Alas, due to Sierra's acquisition and Ken Williams' departure from Sierra, it wasn't meant to be and the rest of the series was never developed. 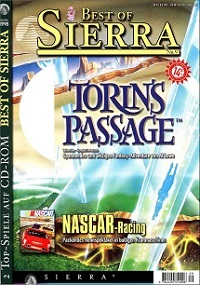 That however does not reduce the unique storyline, characters and graphics of this first installment, a true gem among classic Sierra adventures.